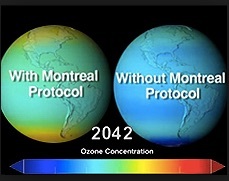 In 1987 the Montreal Protocol on Substances that Deplete the Ozone Layer stipulated that production and consumption of compounds that deplete ozone in the stratosphere—chlorofluorocarbons (CFCs), halons, carbon tetrachloride, and methyl chloroform—were to be phased out. The Protocol, or treaty, was agreed on 16 September 1987 and entered into force on 1 January 1989. As of 2012, all countries of the United Nations, as well as the European Union and other entities, e.g., The Holy See, have ratified the treaty, 197 countries in all. Scientific theory and evidence indicated that, once emitted into the atmosphere, these compounds could significantly deplete the stratospheric ozone layer that shields the planet from damaging UV-B radiation. Provisions were included to address the special needs of developing countries with low consumption rates in order to avoid hindering their development. Flexibility in the agreement allowed for adjustments in light of developing scientific evidence without requiring a complete renegotiation. Recent studies confirm a statistically significant and sustained increase in stratospheric ozone for the first time in 35 years, as a result of the phasing out of the ozone-destroying chemicals under the Protocol. The protocol is a model of collective, cooperative action on the part of countries to protect the global environment, a model that was seen as applicable to global warming. In 1988 the Intergovernmental Panel on Climate Change (IPCC) was created to assess the potential impact of human-induced climate change and to develop options for adaptation and mitigation. The IPCC was created to periodically gather the current findings of the leading researchers and policymakers on global warming, and to publish the consensus reached in the literature. That consensus in turn serves as the basis for international negotiations and national action to address global warming. However, the IPCC global negotiations have not yet resulted in a legally binding agreement comparable to the Montreal Protocol. Analyse how the Montreal Protocol differs from the IPCC global negotiations, and why the IPCC negotiations have failed to produce an agreement comparable to the Protocol. Compare how the Protocol treats requirements for developing countries in phasing out the production of covered materials, and how the obligation of developing countries to reduce greenhouse gases is treated in the IPCC negotiations. What chemicals were developed to replace the phased out substances, and what advantages and disadvantages do these replacement chemicals have in comparison to those they replaced. Robert Emmet Hernan, “Global Climate Change,” in This Borrowed Earth: Lessons from the 15 Worst Environmental Disasters Around the World (in English by PalgraveMacmillan, 2010; in Chinese by China Machine Press, 2011).